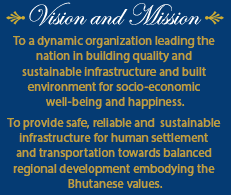 With the start of modern development in the country (launch of the first five year plan) Bhutan Engineering Services, responsible for construction works in the country, was established in October 1961. By the 6th FYP physical planning and implementation works were administered through Central Town Planning Committee (CTPC) which in April 1984 was upgraded to National Urban Development Corporation (NUDC). In 1989 the functions of the NUDC were transferred to the then Ministry of Social Services with the aim of integrating urban affairs with other sectors in human settlement and was named as the Department of Works and Housing. This department was later renamed as the Public Works Department (PWD) and placed under the then Ministry of Communications (MoC). In 1997 PWD was bifurcated into the Department of Roads (DoR) and the Department of Urban Development and Housing (DUDH). Then in 2003 MoC was bifurcated into the Ministry of Information and Communication and the Ministry of Works and Human Settlement (MoWHS). At the same time, DUDH was bifurcated into the National Housing Development Corporation and the Department of Urban Development and Engineering Services (DUDES). The rapid socio-economic development in the country placed immense demand on and for provision of infrastructure and development plans. In particular, the Department of Urban Development and Engineering Services, responsible for urban settlements and engineering services in the country, is faced with increasing challenges. In addition to the complexity of urbanization, rapid changes are also taking place in villages and other settlements. On the other hand, there is increasing need for engineering services in the country and the technical support for local governments especially in view of the development focus of the Eleventh Five Year Plan. Therefore, to enable efficient delivery of services and to facilitate timely development, the Lhengye Zhungtshog approved the bifurcation of DUDES into the Department of Engineering Services and the Department of Human Settlement (DHS). This bifurcation would enable the two departments to specialize and focus more clearly on their respective areas of responsibilities.